Fujitsu AC error codes. When error codes appear on your Fujitsu Air Conditioner this tells the you there is a problem. Knowing the error code definition will help you to understand the present fault. You can then troubleshoot the issue or call a technician. 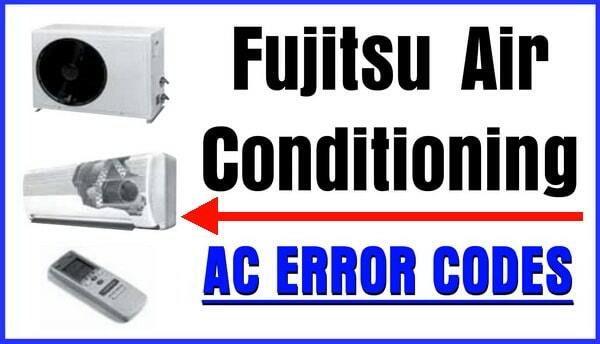 NOTE: There are also general troubleshooting charts below to assist you in fixing your Fujitsu AC and a PDF Service Manual file for most current Fujitsu Air Conditioners (See model numbers that apply to the error codes at the bottom of this page). Covers the current Inverter product range. 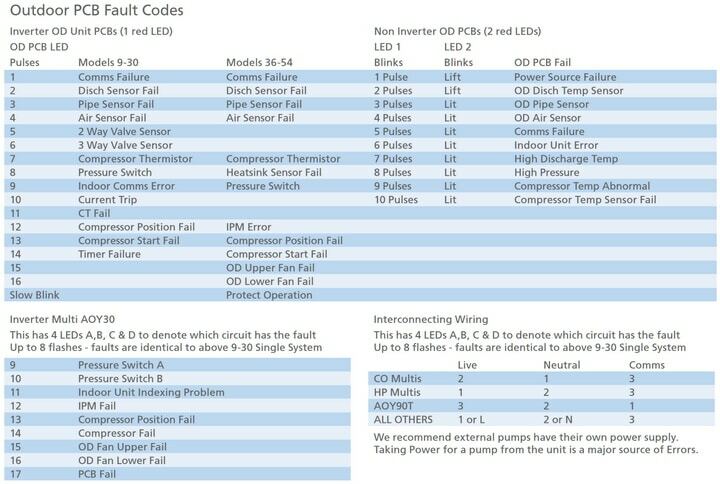 Code Consists of Indoor Unit Address Followed by the Fault Code Below. No E denotes No Fault. When E:EE is displayed switch unit off and press the temp up and temp down buttons simultaneously for 3 seconds. Press Temp Up and Temp Down Buttons together for 3 seconds. Switch Unit Off & Press Master & Fan Buttons together for 3 seconds. 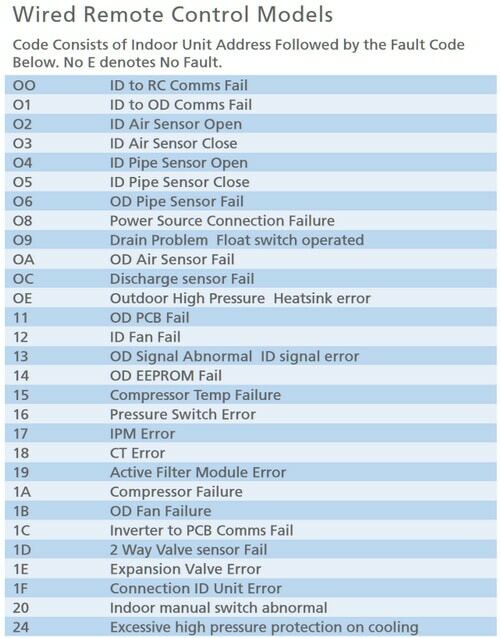 NOTE: If you have flashing red, green, or yellow LEDs or lights on your Fujitsu AC unit, please see the Fujitsu AC PDF troubleshooting chart here. These pages cover the current Inverter product range. They also cover the ARY60U, ARY54U Single and AOY19/24F/U Multi Systems. Wall Mounted Single Systems ASY, ASYA & ASYB Includes AWYZ Nokria Models. 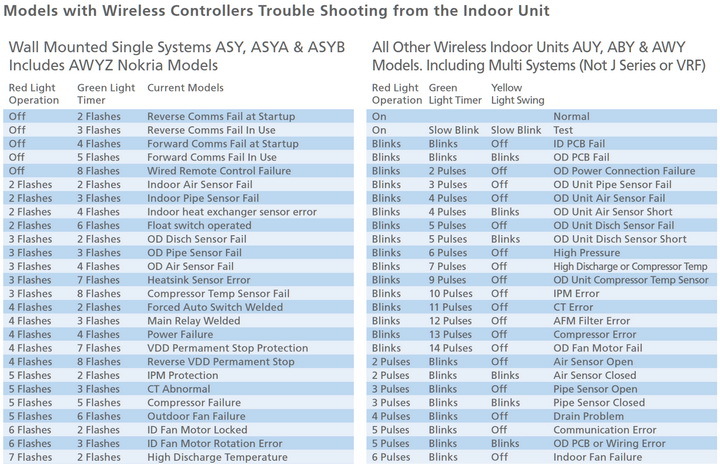 All Other Wireless Indoor Units AUY, ABY & AWY Models. Including Multi Systems (Not J Series or VRF). Need help? Please leave your question below. We can assist with all AC error codes.